A to-do list can be invaluable for productivity, but sometimes, you may find yourself working on several different tasks at a time, which clutters up your mind and prevents you from truly finishing tasks. There’s a way to improve on the traditional to-do list, though, and that’s with Kanban, a system of workflow organization that’s taken factories, software development teams, and now individuals the world over by storm. Kanban stems from research done by Toyota in the late 1940s with the aim of increasing efficiency in their factories, from which they devised a system using a series of cards signaling a depletion of inventory. A factory might implement a simple kanban system with three bins: one on the factory floor where parts or raw materials are received, one at the inventory room where finished products are kept, and one at the loading dock where finished products are shipped to customers, each with its own kanban card. When a bin runs out of whatever it should be storing, it sends a card back to the previous step requesting more of it. If followed correctly, no step produces anything when it doesn’t need to, and the process becomes much more efficient. 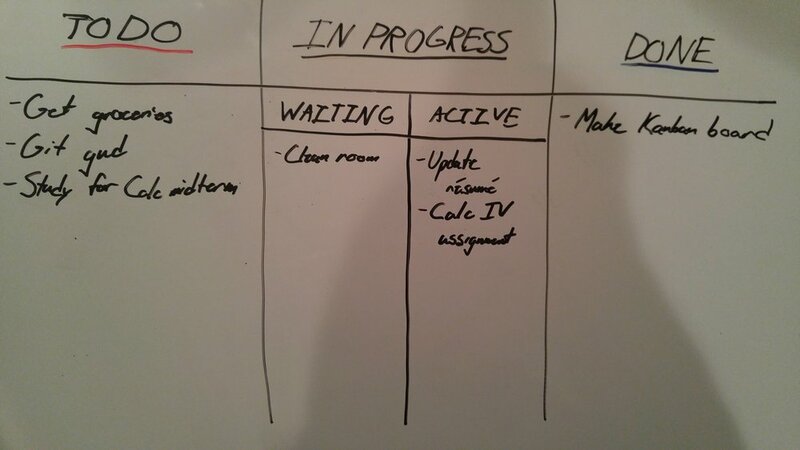 Whenever you want to work on something, work on an item from your “in progress” list until it’s finished (then move it to your “done” list), and if your “in progress” list is empty, move an item from your “to do” list to your “in progress” list and start working on it. The result of this is less tasks left on the back burner while they’re still in progress, and therefore, less mental clutter. Ideally, you should have only one task “in progress” at any given time, but in practice, people usually keep a few different ones around. Pick any limit to start out (I recommend 2 or 3), and adjust it as you get used to the process and find how many tasks you can handle at a time. Once you get whatever else you need to complete the task, you should move the task from “waiting” to “active”, so it can be worked on again as soon as possible. Of course, this isn’t the only modification you can make – you can also add a column for recurring tasks, or another for things like tests that you can’t “finish” by yourself, or even multiple boards for tasks with different workflows. The possibilities are endless, and more information about this subject can be easily found online.